Scope I have long been interested in engine tuning. Ignition and carburetion issues seem to be the most challenging to most motorcycle hobbyists and mechanics. I have had the good fortune to have ample schooling in physics, electromagnetics, electronics, flow dynamics and mechanics to somewhat tie it all together. I want to mention this article is not intended to be a beginners introduction to ignitions. Many topics and data are more easily interpreted by persons with the needed technical background. That is why my explanations may seem rather short, since the data should speak for itself. The evolution of commercial electronics has allowed the packaging of various commercial ignition products for our British bikes. The investigation of these systems is quite natural for me, as it is similar to the work that I do everyday. As the Boyer Mk III seems to be phasing out and being replaced by the micro-digital and micro-power systems, I wanted to first review the old systems and second, press forward with a fresh look at the new technology. 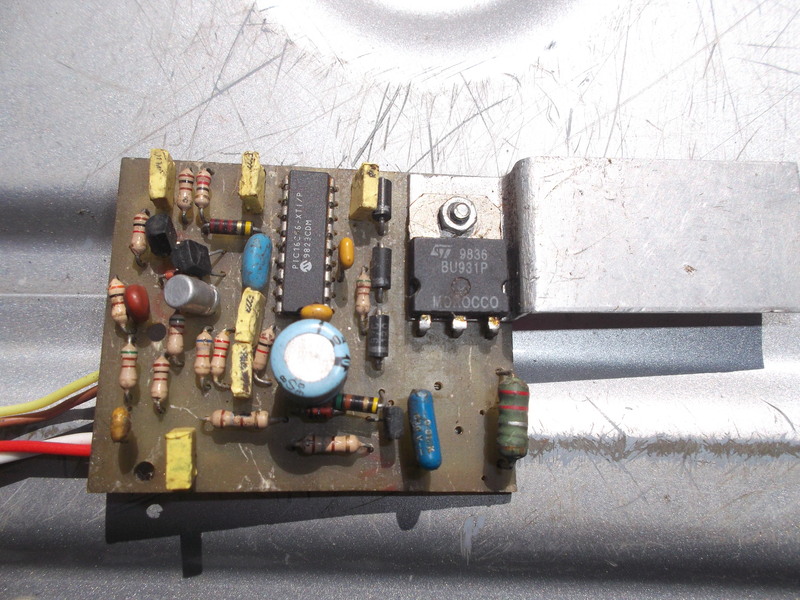 I felt it would only be fair to take another, and closer, look at the Lucas Rita (Racing Ignition Transistor Amplifier). Some of the things I wanted to review were the high voltage spark potential, system current draw, pulse stability, and especially the advance curve. I still believe that one advance curve is still asking too much black magic from these silver, black or red boxes. I even included in the test, a few non-Norton devices for advance curve comparison purposes. I was astonished by some of the comparisons. The comparison of like systems, showing production consistency, only caught my eye as the tests proceeded. The system operation under electrical duress (low voltage) was especially important to my test, considering the Norton Commando E-Start start/no start and the potentially damaging kick backs that I have seen so often on other E-Start owners bikes. The upper limit of 14.3VDC was used for all ignition systems, since this should be the charging systems zener voltage and therefore the regulation point for the Norton’s electrical system. In this series of tests, since I did not own the MD and MP samples, so I did not depot and reverse engineer these new boyers, which I had done in my Boyer Exposed article of Oct 1989. The purpose of this research was not to discover trade secrets, but verify application suitability of these systems, and general technical specifications. A little refurbishment was required as the capacitors were 46 years old and were electrically leaky, these were replaced. The rectifier tube was replaced with high voltage, high current diodes. My 700vdc xenon bulb strobe power power supply was now ready. The electric tachometer was checked for accuracy. Its readout upper limit is 2800 distributor rpm. That equates to 5600 engine rpm. Dynodaves little brute DC power supply. I had to build a brute power supply with a bit of filtering to allow, adjustability, average and surge current demand and keep rectification ripple out of the ignitions themselves so I wouldn't be measuring power supply ripple in my tests. Ignition O-scope, real time-self adjusting time base. 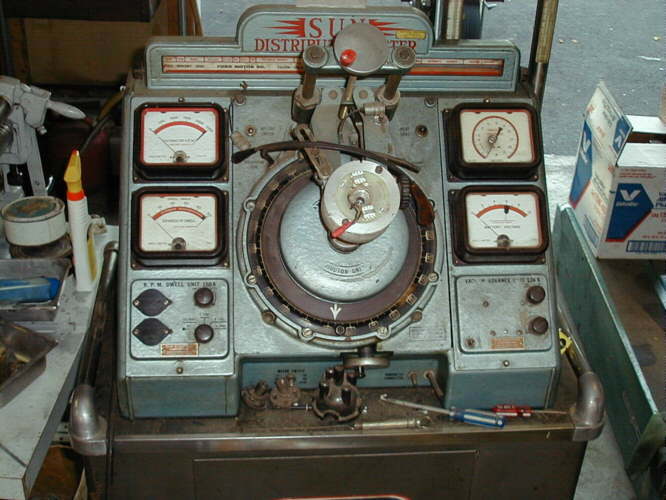 Additional voltage and current measurements with Simpson 260 series 8 , Simpson 460, Triplett 310 type 6 and SnapOn MT402 . Of significant interest to me was the variation I found among the three brand new samples I own. Show below is raw data. When each of them is installed to 31’ on an engine, they will have 5’ starting timing difference.These production variations alone could explain why some nortons when set up by the prescribed procedure have no pinging problems and another bikes timing must be retarded to get satisfactory results. Recently, I have reluctantly become convinced the tri/bsa boyers are intended to have the same curve as the norton unit. To include the bsa/tri curve to the 3 norton devices I have already tested, bodes poorly for the MKIII. 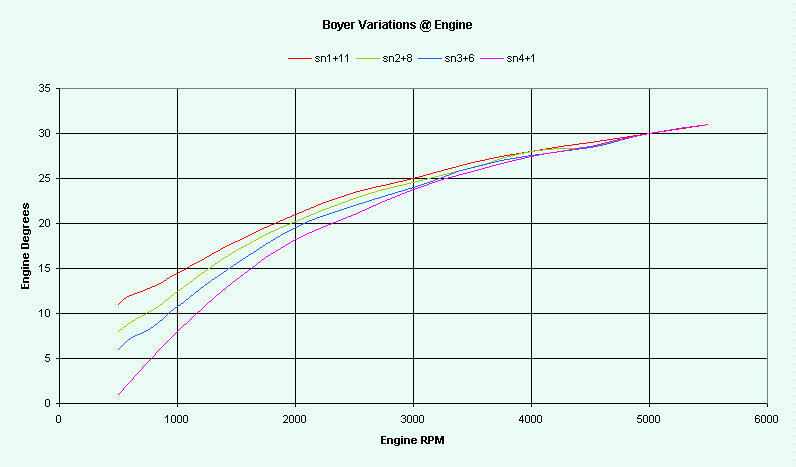 I would assume that boyer ships ignitions that meet there specifications, and if that is the case then these 4 curves indicate the broad spec that passes for acceptable. A later version has been updated to include newer style components. The following diagrams were generously offered to me for display. Many wild claims as to the current draw for the boyer have been proclaimed. So I made some measurements. The first measurement was basically with the distributor machine at idle speed, then the current draw throught two stock 6V commando lucas coils. See coil descriptions for details. Of course, other coils would not give exactically the same results, but would be proportional. The measurement was at the 14.3vdc voltage from idle then increasing the speed to full running RPM with the current noted. The coil drive on-time % goes down as the whole ignition cycle “time” gets shorter. This results in a ever decreasing duty cycle and therefore, average current. This is likely the opposite effect of what is really desired. These current measurements are the result of averaging together the peak current during coil drive on time and zero current during off time. Otherwise, in non-ignition electronics terminology this on/off ratio would be called called duty cycle. I was curious to find out how low, in supplied voltage, the boyer would continue to operate and provide a spark. The test I performed was to provide a decreasing voltage to the box while running the distributor machine at basically a cranking speed or low idle. I was surprised to find that as the voltage was run down, the boyers output started to trigger the spark in an erratic advanced and retarded display of timing (jitter). So the claimed lower limit of 10.8vdc, for “proper” operation, is verified. The spark jitter is of main concern primarily for E-start machines where an over advanced ignition pulse may cause kick back. Of course the E-starts ignition low voltage is caused by the use of the starter and then loads the battery down. There is then the additional line loss between the battery and the ignition module. A fellow with a BSA twin Boyer with a low battery, who broke his ankle in front of his bar buddies, may also be interested in this data as to why the kickback/backfire may have happened and then causing some discomfort and embarrassment. The ignition ultimately quit sparking at 6.5 volts. The ignition module was subjected to electrical duress at an idle/starting speed. The coils used were the same stock Norton commando 6V units. The LR made consistently repeatable timed pulses until finally at 5vdc, the unit quit making sparks. It had NO visually observable voltage duress induced jitter. The biggest potential flaw I have found with the LR is that the rotor supplied does not always seat reliably in the taper of the camshaft. Then as the LR rotor wobbles the gaps differ between the two rotor tips and the stationary pick-up. This causes the two cylinders to fire at different degrees. On mine, once both gaps were made the same by filing one rotor tip the firing was absolutely the same for both cylinders. The LR “is” electrically the hungriest ignition unit tested. The Lucas Rita current draw changes very little as the RPM goes up, it does go down slightly due to decreased duty cycle.. The coil drive is off for a fixed 0.16 milliseconds. When the LR is cold, With the stock coils it draws a little over 3amps. As it warms up, at 14.3vdc it draws 2.7Amps reflecting the high coil drive duty cycle that is 99.2% at idle, and reduces to 98% at 5000rpm. The production repeatability appears to be quite good as evidenced by the advance curves from my two spare units. Despite the added cost, these are by far my favorite. This ignition was run up on the distributor machine and when 2850 rpm was reached the spark intensity visually went down. This certainly sparked my curiosity. A look at the voltage supplied to the coil quickly showed the reason for this phenomenon. The coil drive control is quite simple. However, this digital coil drive must be thought of in terms other than conventional dwell and therefore is not expressed in degrees.The coil NON drive time is fixed in a series of stepped time periods. Starting mode appears to be 9 milliseconds of coil drive OFF time before the coil drive voltage is turned on in preparation for firing. From 250/500 rpm to about 2200rpm, the next coil drive OFF time is reduced to a 4 milli second period. Thereby increasing the coil drive ON time. From 2200rpm to 2850rpm, the next step for coil drive OFF time is reduced again to 3 millisecond period, again increasing the ON time. At 2850rpm the coil drive OFF time is decreased quite a bit to .5 milliseconds. At 2850 distributor RPM the sparks visual intensity goes down. What gives? My theory is as follows. Well, I noticed that a spark plug quite frequently sparks a second and sometimes a third time upon shutting off the coil drive. When left alone, the coils tank circuit primary continues to oscillate, but when this last step (.5Msec coil drive OFF time) is achieved the coil drive is turned back on during the period these “residual” sparks might otherwise occur. This obviously eliminates any possibility for these residual sparks to occur. The coil is not allowed to cease oscillation on its own. The coil drive is turned back on right away right after the first plug firing. You no longer see the second or third spark so the visual effect is then understood. The operating advance curve data that I obtained was virtually the same as what they published. Their published literature stating control of over timing angle (advance/retard), ignition coil energy, tick over stabilization, and rev limit. Are now better understood. The meaning of their term “starting speed”still eludes me. Their ability to custom make a curve to order is a very good feature. I almost missed the opportunity to test this device by not being fully aware that the micropower was different from the microdigital. This little “red” box is easily confused if the name is not specifically refered to. This device is in fact very different and I found it also very fascinating. This “other” little red box must have some of the same circuitry of the Micro Digital. The advance curve seems to be the same as the MD. The trigger pick-up is the same one as the MK III and the MD Boyers. This is where the similarity ends. The output section of this device seems to have its roots back in the 70’s. It appears to be some sort of a capacitive discharge similar to the big SCR CDI’s of yesteryear. It has an internal 12-14.3vdc to 400vdc converter. This is evident by the 400volt 12-20 microsecond pulse shot out of this box to the coil. The 400vdc output seems to be quite well regulated as the output voltage stays stable even with a varying input voltage and across the RPM range which also affects the loading of the power supply/converter. This type of regulation is easily obtainable with a pulse width modulation integrated chip controlling the width of the driver circuitry running the step up transformer. The 400vdc output pulse seems to be width controlled and may differ from the old SCR CDIs of yesteryear that would totally dump the complete capacitors charge. 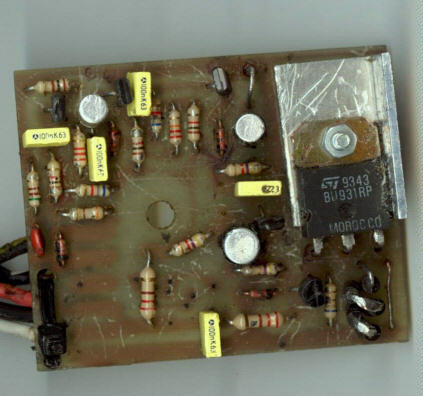 This unit may possibly be J-FET controlled on the output stage. Just guessing of course! The power consumption is quite minimal and would be the best thing going for a total loss race bike ignition system. A small battery would likely run this system for a full days racing. It was only drawing .2 to .3 amps while running at speed and only pulled 1.2 amps during startup. A conventional 12v coil saturation type system is very inefficient and heat is its biggest product and only a little of the energy goes into spark generation. The special coil needed for this system is electrically similar in characteristics to a conventional coil. The most obvious technical difference is that, unlike a conventional coil, the secondary is totally isolated from the primary. This an exceptional little unit that I would like to try on my Norton someday. I would like to have a different curve however. This unit tested was actually a Triumph/BSA unit. People who have this system have raved to me about it. I feel they may well be justified in their praise. The installation instructions are basically the same as the earlier Boyers. I was at a loss though, to find any suggestion in the accompanying sheet as to what it should be timed to. The unit I depotted this day is marked Boyer "micropower". A closer look at the internals shows technical characteristics that did not seem obvious at first look. The first notions I had, about how it worked, were giving it more technical capability than I thought. 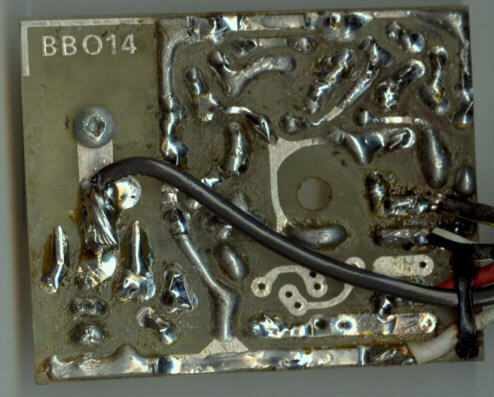 The actual circuitry of this device shows that it may be a short dwell device giving the output darlington transistor the ability to keep it's heat disappation load (duty cycle) down to a manageable level. This characteristic would explain why standard coils would not function well with the MP. It then gains the ability to run a higher current (lower resistance) primary coil that will transfer the energy into a hotter spark, without the heat of a long dwell system.. It's 400v pulse was actually the 3-130v zeners clipping on the inductive overshoot of the coil. It was NOT the drive pulse itself. 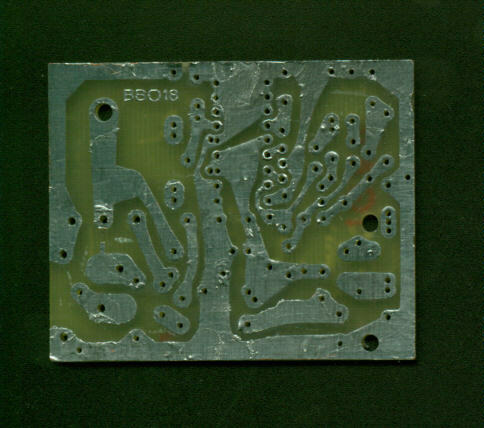 The MICROCHIP PIC16C56 XT I/P microprocessor , clocked at 4Mhz, does the calulations to sense the timing triggers then derive the delay for the output switching. 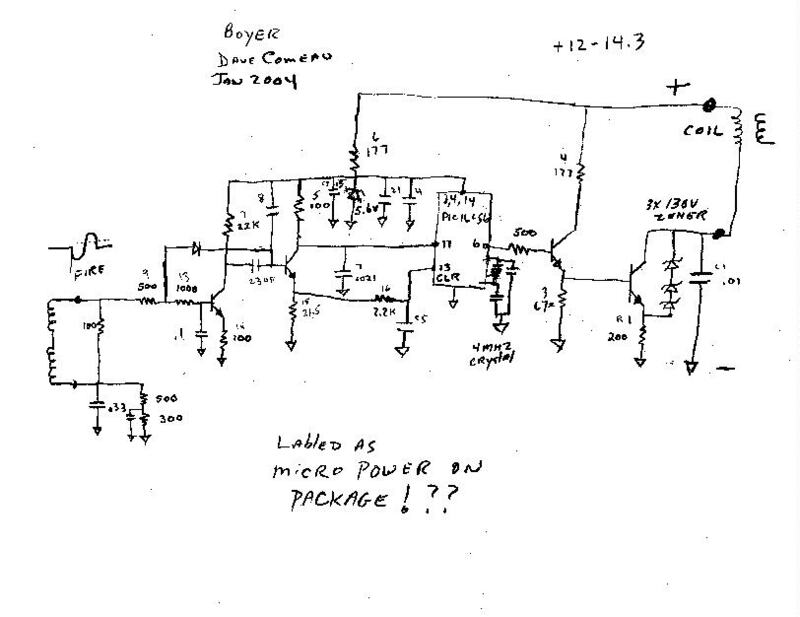 In final assessment I wonder how boyers litertature that stated a 400v pulse is the output of the micropower can be true. This unit , driven through a load resistor instead of a coil, shows it is only switching the 12v source supply. I wonder if it was mistakenly packaged and labled? of the two coils. The ballast resistor makes heat with the other half.